As mentioned in the previous part of this article, on Friday 23 October 1942, the US Navy's Noumea Port Director, Lieutenant Commander John D. Andrews, prepared the sailing instructions for the next section of the SS President Coolidge's journey. At 1530 hours on Saturday 24 October 1942, a pilot came aboard the ship and she weighed anchor. At 1545 hours the ship passed throught the submarine net and at 1739 hours the ship again passed Amadee Island and the pilot left the ship. This indicates to me that the ship sailed via the open sea rather than travelled through the Havannah-Boulari Passage. 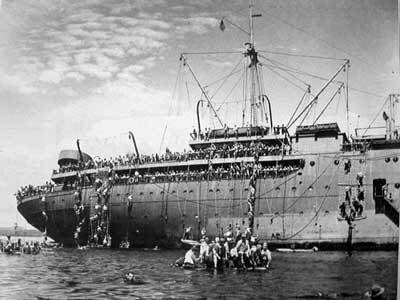 There were now 5,050 Army troops, 50 US Navy Guard (perhaps 51) and Communications personnel (carried on all merchant ships) and 340 (perhaps 339) crew giving a total of 5,440 persons. The ship was under the control of Captain Henry Nelson, a long serving Dollar and American President lines skipper. He was 63 years old at the time. The travel instructions required the Coolidge to end up at a point called "Hypo" which was 5.6 miles due east of Tutuba Island which is located at the eastern end of Segond Channel. There was apparently nothing in the orders about what to do after arriving at this point. At 0039 hours on Sunday 25 October 1942, Lieutenant C. Craig Hosmer, US Navy Reserve, in charge of the Armed Guard Unit assigned to the ship (Armed Guards were responsible for manning the ship's guns as well as providing security for the ship when in port) reported in his Log Book entitled "Armed Guard Unit Log Book - S.S.President Coolidge" that a ship was sighted ahead of the Coolidge (there is a complete word by word account of Lt Hosmer's log entry for the 26 October 1942 on separate page). After some time this was determined to be a cargo ship travelling in the same direction and at 0128 she was passed by the Coolidge. That morning several islands were passed by the ship. At 1033 hours the same day, an aircraft was sighted and once again battle alarm was sounded. At 1037 it was identified as being friendly. At 1120 hours yet another plane was sighted and battle alarms sounded. Eight minutes later it too was declared friendly. Note: all times in this article are based on Lt Hosmer's log which was written up on the morning of 27 October 1942. He states that while they are guesses, they are fairly accurate, although his watch may have been one minute fast. The times underlined are said to be accurate to a minute. At 0500 hours on Monday 26 October 1942 the SS President Coolidge passed between two islands and at 0720 hours Espiritu Santo was sighted. At 0739 hours a ship was sighted bearing 345° and all guns were aimed at it. At 0750 hours it was determined that the ship was on an approaching course. At 0759 the vessel was challenged. Three minutes later the ship was ascertained to the friendly. This was the destroyer USS Sterett on anti-submarine patrol. It is reported that the Sterett had flashed a signal light at the Coolidge and that she had nothing to pass onto the Coolidge, even when asked. The Coolidge was entering Segond Channel from the south-east and was obviously aiming for the eastern end of the channel. What Captain Nelson and the crew did not know was that all but one access into Segond Channel were mined. Just after midnight on 3 August 1942, USS Gamble, USS Breese and USS Tracy left Luganville in Espiritu Santo, New Hebrides, to lay a series of minefields to protect Segond Channel. This channel was the main "harbour" of Espiritu Santo. The three ships laid mines at three locations. These three fields were at the south-western entrance to Segond Channel, between Malo Island and the mainland (Field One) and nearby between the south-western corner of Aore Island and the mainland (Field Two) further blocking Segond Channel. The third field was at the eastern end of Segond Channel. This field was laid in two, north-south parallel sections. The first was between Bogacio Island (now called Bokissa Island) and the north-eastern corner of Aore Island (basically on the eastern side of Aore Island) and another section running south from the south-east corner of the mainland towards the south-western corner of Tutuba Island (Field Three). This created an entrance, really a small gap, from the south-west between Tutuba and Bogacio Islands. The obvious idea was that ships would enter this gap and once in the main Segond Channel, turn left and proceed towards Luganville. Later on, two other fields were laid, one further east of this point and another along the eastern coast. In total, 171 Mark VI mines were laid on the morning of 3 August 1942. For more information about the USS Gamble, USS Breese and USS Tracy and to see some photos of the Gamble and Breese, see the USS Tucker page. The Coolidge shortly after running agound. These actions basically made Segond Channel accessible through only one point, the eastern channel via the southern channel between Tutuba Island and Aore Island, on the eastern side of Bokissa Island. This was not the channel chosen by Captain Nelson. 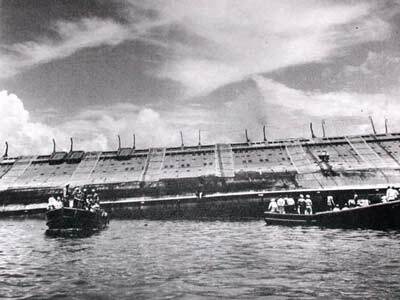 Of interest is the fact that a US warship, the USS Tucker, had been sunk at the other end of Segond Channel by a minefield on 3 August 1942, less than three months earlier. At 0844 a small vessel was sighted in the cover of an island at a range of 10 miles. This boat was a patrol boat, PC479. The Coolidge was said to be six miles from "Hypo" (the rendeavous point). The patrol boat was at the entrance to the safe channel. At 0858 hours they signalled to the larger vessel using a signal lamp but they lost sight of each other as Tutuba Island came between them. The message was not able to be deciphered by the Signal Officer. When asked the meaning of the message, the patrol boat clarified its message as being a merchant ship challenge and indentification was made. It is said that the patrol craft gave chase but never had any chance of catching the much larger ship which was far ahead. This is not mentioned in Lt Hosmer's log. At 0906 the Coolidge entered the main entrance to Segond Channel (Scorff Passage). Lt Hosmer reported seeing several ships in port, including a cruiser (USS Chester). At 0928 hours the USS Chester challenged the incoming vessel but (it is reported) after the Coolidge responded, it ceased the communication. I remember that I was standing on deck. There were flashing signals on shore and a Naval destroyer was blinking at us, too. S T O P .
Ensign Doran S. Weinstein, the Signals Officer that morning (in fact the officer in charge of Signals on the ship and who travelled on the previous voyage of the ship), immediately shouted to the Captain to stop. The bridge telegraph signalled to the engine room to put the engines into reverse. The time was 0935 (Lt Hosmer's time is 0930 for this - see later) and the momentum of the large vessel travelling at almost full speed (17.5 knots) meant that it was going to take a long time to pull the Coolidge up. Meanwhile, Ensign Weinstein and his offsider took down the entire message which was "Stop you are standing into mines". At 0930 hours on Monday 26 October 1942, an explosion rocked the ship. Within 30 seconds (0930 1/2 hours) there was another explosion as the ship hit a second mine. The ship was shaken badly. According to Lt Hosmer, a list to port commenced immediately. At this time I felt the first concussion, then a second - shortly after. Someone yelled "Hard right rudder! The ship turned towards shore. It started going down by the stern and tilted to the left. At first no on got off. The ship's crew was preparing for evacuation. This corresponds with the above paragraphs. A fireman, 30 year old Robert Reid, had been killed by one of the explosions or the resultant flooding. 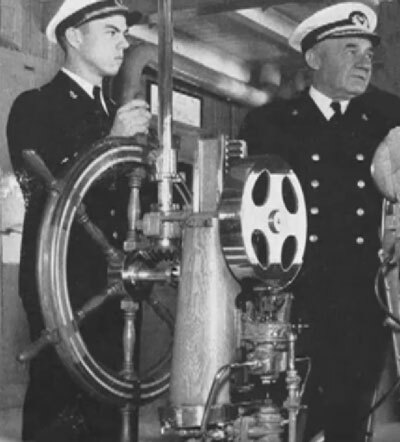 The crew of the engine room was in dire straits and their story alone could fill a page. Needless to say, it was a dramatic and heroic escape by three of the crew. A brief description is that another fireman was severely burned and crippled by the explosions and Howard Quinn, Chief Engineer and John L. Paton, First Engineer, went through a ventilator to the fireroom, found the fireman and carried him to safety. CE Quinn and FE Paton were awarded the Merchant Marine Distinguished Service Medal for their parts in this rescue. See Coolidge Heroes Page for more information on this rescue. On the day of the sinking I was in my bunk. When the ship hit the mine I fell from the top bunk onto the floor. An alert was given and we were told that the ship was not going to sink. We were instructed to stay in our quarters. Then the ship hit another mine. This time an alert went out that the ship was going to sink and we were instructed to leave. I was on the port side. I made my way to the lobby and remember sitting in a chair. (I also remember seeing a painting of the lady in the photo on your web site [comment - this is, of course, the Lady. Whether Mr Schneider saw the actual figurine or a painting of it I do not know]). The ship pitched and my chair slid to the other side of the lobby. I made my way to the deck and jumped from the deck to a life boat with three men already on board. We started towards shore and watched the ship go down. On that fateful day of the sinking, I was on deck and heard people yelling, "Torpedo .... torpedo .... torpedo!" The next thing I knew was that there was an ear splitting explosion that lifted the front of the ship up. Then when it settled back down into the water, there was yet another explosion. [this tallies with the two mines but presumably the torpedo shout was either faulty memory - someone singing mines, mines - or a mistake by whoever was shouting out. 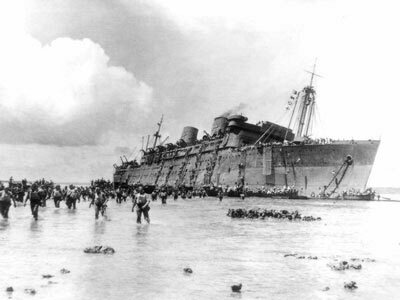 Note that in Craig Hosmer's Log Book he says that some of his men thought the ship had been hit by a torpedo] You mentioned in your writings [Michael McFadyen's Web Page on Coolidge] about the ship's captain running aground. This could be true but I have no knowledge of that ... "it was real hectic about that time." We were led to believe that the ship's captain had panicked and accidentally hit the mines. Like I said before, troops began stripping there [sic] combat gear preparing to abandon ship. Once I was on shore, some US Navy troops gave me two sets of clothing and shoes. One to wear while washing the other. A full issue of clothing came about one month later. Roy H. Dobbins, was the Coolidge's carpenter. His daughter, Julie Dobbins, told me the following story as told to her by her father (he died 22 February 1999). For a more detailed memory of Mr Dobbins, see Memories Page. Dad's copy of The Lady and the President by Peter Stone has excellent pictures and from a diagram included in the book he told me and showed me that he was in his quarters (a room with 9 bunks) on "C" deck, starboard side, bow end when it hit the mine. Dad was the ship's carpenter on this trip. He had been in the U.S. Merchant Marines since 1939, and had sailed on it [the Coolidge] prior to it being modified for carrying troops, in all he sailed on the Coolidge for at least 13 months. He found the Coolidge to be a beautiful ship. He commented that this ship burned a barrel of oil per minute for fuel. She sailed quite powerfully. At the time of the explosion he had just retired from his shift (he couldn't remember the exact time of the day). When the Captain blasted the siren he gathered up only the clothes on his back AND his Seamen's wallet. He recalls the escape from the ship a close one. The crew had had lifeboat drills, so he went to his assigned one. He also recalls that whoever the s-o-b was who was ringing the alarm bells was "ringing the hell out of the bells". Dad stated that he was helmsman in the lifeboat of more than 25 Merchant Marines and U.S. Army soldiers. His lifeboat had reached land when the Coolidge sank. He remembers being very sad - as though he had lost a good friend. His admiration for the Captain was maintained as he continued to sail with him on later voyages. Dad continues to defend the innocence of Captain Henry Nelson regarding his situation with the loss of the Coolidge. Captain Nelson ordered the Coolidge to be abandoned. Whether this was before or after people had already made this decision themselves is not clear. At 0940 hours Lt Hosmer reports that the abandon ship is proceeding with no problems or panic. There are rescue boats approaching the ship while the lifeboats are taking people from the ship to close to the shore where they wade ashore. By 0945 hours the list is 10° and Lt Hosmer notes that it is apparent that the ship will heel over and slip off the coral reef. The stern gun crew reports that the "stern is going down fairly fast". Ten minutes later he goes to his cabin to retrieve papers and other items. At 1000 hours the list is 14° and Lt Hosmer orders the anti-aircraft gun crews to move to the starboard side of the bridge and for the crews of the three stern guns to abandon ship. At 1010 he orders the crews of the remaining large guns to abandon ship. The list is 16°. At 1012 Lt Hosmer records that the nets are full of men waiting for the lifeboats and there are more men waiting on the now increasingly angled decks. "She can't stay up much longer" he writes. He orders men at the bottom of nets to jump into the water and swim ashore (they all have life jackets on). Four minutes later he reports that the list is 18.5° and men still will not jump in. He tells men above to "kick men in face to get them off". There is now a long gap in Lt Hosmer's account, the next report is 1045 hours. 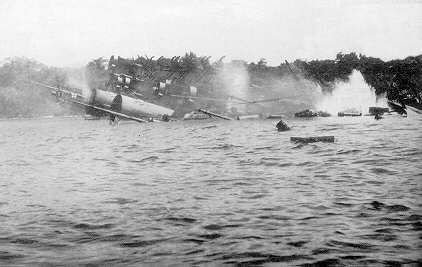 As Lt Hosmer indicates, the evacuation was quite orderly, although the men were reluctant to jump into the water. As I indicated in the previous page, there had been many lifeboat drills earlier in the trip as the Coolidge crossed the Pacific. Despite this, leaking oil and the increasing angle of list made it impossible to launch some lifeboats and the cargo nets slung over the sides (see the photos) made it difficult to climb down, especially for those who tried to take rifles and equipment with them. As can been seen from the photos, all the soldiers and crew had lifejackets on so it was unlikely that anyone was going to drown. Anyway, as the ship was so close to shore, there was no panic and people even thought that they would be able to come back later and collect their equipment. Dad says an eerie calmness came over the ship after the second mine was struck, that there was great order and calmness throughout the crew and troops aboard. He said there was a lot of oil on the water surface and that he had walked down the side of the Coolidge and swam away to avoid being sucked down with her. 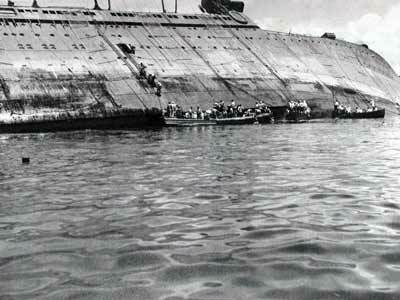 Many boats were dispatched from shore to pick up survivors, others swam the few yards to shore. It was organized chaos, but most of the soldiers stayed calm throughout the evacuation. Steve was at the 60th Anniversary of the sinking of the SS President Coolidge in Espiritu Santo in October 2002. He has also e-mailed me and at the Anniversary I spoke to him a number of times. In 1993 he had returned to Santo for the (delayed) 50th Anniversary. While there, he heard divers speak about the wreck of the ship. he decided there and then that he would learn to dive. He returned again the next year, heard more stories and at some time (either on this trip or when he returned to the USA) spoke to Allan Power of Allan Power Diving Services about diving the wreck. Allan declined to take Steve diving. When Steve returned to the USA, he learnt to dive, at the age of about 80 years old. In 1998 he returned yet again to Santo and on 24 June 1998 he dived with Allan Power to the bow. On that trip he did at least two more dives, one to the Promenade Deck and one to Hold Two. On 26 October 2002 he dived to the bow, aged almost 86 years old. As far as can be known, he is only the second survivor to dive on the ship (see Michael Jones comments to me), and almost certainly the oldest. I spoke to Steve a number of times on his 2002 trip to Santo. Joe Ignatz (see previous) told me via his daughter, Diane, that he remembers climbing down a rope ladder but the last rung was about 5 feet above the water. He jumped. Diane remembers her father and his mates Pete and Mike telling her that they felt as if their boots were going to go through the bottom of the boat. The boat motored them to shore and they had to jump into 4 feet of water and wade ashore. Joe says that at this time he remembered that he had left all his personal things on the boat. He checked his pockets and found he had the grand total of one comb. Mr Ignatz also told me of officers abandoning ship early but this is incorrect if he meant the ship's officers. It is possible that he saw some of Lt Hosmer's men, including one who took his unit's papers and valuables off early in the piece (see Lt Hosmer's diary). As they were members of the Navy and were dressed similar to the ship's crew, this may have been what he saw. Bertram Miles was 24 years old when the Coolidge sank. I am not sure if he jumped into the water or climbed into a lifeboat, but when he left the ship he took some matches wrapped in foil with him. He kept these matches for the rest of his life and before he died, the matches were used to light a fire at an American Legion event. The fire was used to cook fish. His family still has the matches in the original foil. 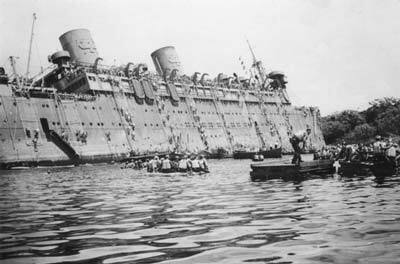 The cruiser USS Chester was in Santo harbour for emergency repairs prior to travelling to Sydney for even more repairs. The Captain sent out his lifeboats and rescued 440 of the Coolidge's crew and passengers. At 1045 hours Lt Hosmer reported that he was finally having success in getting the men to jump into the water. He is now at the aft end of the Boat Deck (if this is correct, it is near the pool) and the last of the men are now on the ropes. It is a difficult task to walk due to the extreme list. 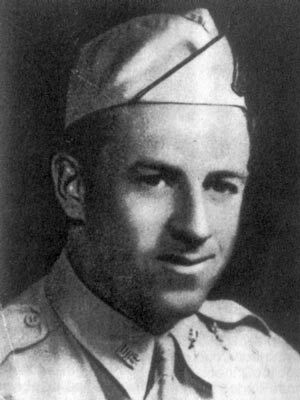 Two minutes later he is near the Bridge when Ensign Weinstein tells him that Jack Rhodes (BM Second Class), has gone in the water to save a drowning merchant marine man. The Coolidge's Chief Officer tells the remaining men to get off while they can so they all move towards a motor boat. At 1049 hours they board the boat which is already occupied by Captain Nelson. While doing this, a Philippino crewman is seen hanging onto a metal ladder. He has a broken arm so Ensign Weinstein jumps to the ship and carries the man down to the boat. One minute later everyone from the Bridge is in this boat. The Coolidge gives a big lurch to port and is now completely on her side. Among the passengers being carried was Captain Elwood J. Euart, from the 103rd Field Artillery. He was born on 28 January 1914 at Pawtucket, Rhode Island, USA. It is not really clear exactly what happened but the myth is that after safely exiting the ship, he became of the view that some of his crew were still inside and he went back in to find them and was lost when the ship suddenly sank. However, I have been contacted by a couple of people and their advice, although not the same, contradicts this myth. Elwood Euart was my battery commander, and we loved him dearly. Untill [sic] recently coming on your website, we were always told that he was master at arms for the day, and was heading for the brig to release four prisoners, when when the ship went down? Still don't know? Captain Euart, two other officers and he were told to stay in their cabin after the first explosion (Stephenson and Euart were cabin mates). They had their bags all packed and their rifles propped up alongside their bunks while they waited for further orders. When one of their rifles slid down to the floor and they began to see the waterline rise up into view out of the porthole, they decided they couldn't wait any longer and had better head up on deck. As they turned to go up the stairs, Captain Euart, who I believe was a Mess Officer, turned the opposite way and said he was worried about "his boys" in the kitchen and wanted to go down and make sure none of them had gotten stuck in the refrigerators/freezers which could have swung shut and trapped them. That was the last time my Dad said he saw Captain Euart. He then told me what he knew about his death, which was as you reported on your website. the desperate attempt to help him climb out through the door of the overturned ship. Dad was very grateful to have had the chance to visit Captain Euart's grave upon his return to San [sic] Espirito Santo [in the late 1970s or early 1980s]. However, a first hand version given by Warrant Officer Robert H. Moshimer (included in The Lady and the President - The Life and Loss of the S.S. President Coolidge by Peter Stone) is a bit different. WO Moshimer (who incidentally claims to have seen the first mine from the bow) went back to where a Service Battery crew were located. This was on C Deck, somewhere near the middle of the ship. He went there as soon as the ship ran aground and he states that when he arrived, his friends had just been told to leave the ship by another route. He then returned to the C Deck Lobby outside the First Class Dining Saloon (this area can be entered nowadays from the lobby in the Continental Lounge or a door in the hull - the same door to feature later in this story). While in the lobby, the list increased dramatically and WO Moshimer went to the inside door (there are a series of two doors like an airlock giving access to the outside) where he found a rope. He threw the rope to men trying to climb the slippery floor towards the door. Also assisting in this were Captain Warren K. Covill and Lt Ward D. MacDonald. They used this to help the men get up to the door. It is said that one of the men was the Chief Mate of the Coolidge, Patrick Carl Olsen. All the men escaped this way and it appears that Captain Euart was the last one left down the bottom of the foyer. He tied the rope to himself. Captain Covill and WO Moshimer went out the outer door and stood on the side of the hull. Suddenly the ship listed further and was now totally on her side. Capt Covill and WO Moshimer attempted to haul Capt Euart up the considerable distance to the doors. At 1052 hours, Lt Hosmer reports that he saw Mr Olsen appear on the side of the ship from somewhere (it is unclear if he did in fact come from inside or some other place). He also saw two other men (Capt Covill and WO Moshimer - it is not clear where Lt MacDonald was now). The two men are trying to pull someone up out of the passenger doors 2/3 of the way aft. Mr Olsen runs to the door and starts helping the other two men. The Coolidge starts to slide backwards off the reef into deeper water. At 1052 1/2 hours there is another great lurch and the ship begins to slide rapidly. Capt Covill and WO Moshimer as well as Mr Olsen were sucked under by the ship. At 1053 hours the SS President Coolidge disappeared beneath the oil and water. There was a great rush of air and dust forced from the ship as water entered the lower parts of the ship and this made the rescue more difficult with waves and huge bubbles disturbing the water. WO Moshimer had to remove his helmet and gear around his waist. A large self-propelled barge that was attempting to rescue the men went out of control, spinning around and around. The three eventually bobbed to the surface but Capt Euart was never seen again. Patrick Olsen was awarded the Merchant Marine Distinguished Service Medal for his part in the rescue attempt. See Coolidge Heroes Page for more information on CO Olsen's part and the citation he received. This story is somewhat confirmed by Richard Schneider's account of the sinking below. The latter part of this story is confirmed by Craig Hosmer in his diary. However, this does not seem to me to be a complete telling of the story as the timeframe of the story does not match the time that the ship was aground before it sank. For example, from the story it only seems like 15 to 30 minutes at the most but the Coolidge did not sink for about 74 minutes. It is unclear what Lt Hosmer did in the 29 minutes between 1016 hours and 1045 hours. I could see the men on the starboard side trying to get off of the ship. I saw one man attempting to be pulled out of a porthole, but he couldn't make it [perhaps this was Captain Euart - see later in article - but he was trying to get out of a door, not a port hole - it could be an error of memory or perhaps the distance from the ship. It tends to confirm other stories related above about Captain Euart]. The water looked oily and I think there were some flames [I do not think this is correct as there is no other record of a fire and the photos do not show it]. The ship righted itself up and went down rear end first. It was an amazing sight, I wasn't far from the sinking ship. I could see the water whirling in a big circle as it went down. I lost all of my equipment and personal belongings, escaping with only the clothes on my back. This is about all I can remember. A huge geyser appeared by her stern bubbling furiously and she seemed to surround herself with a thin film of smoke as if to curtain the final shame of her death throes. More geysers appeared along her side. Her stacks at last touched the water and then with a tragic gracefulness, her bow rose as her stern settled more deeply and she slid off the coral ledge and disappeared from sight. It was 1045. This account roughly tallies with others, although the timing is a little out, understandable considering the hectic situation and the period of time that may have passed between the event and the recording of their memories. The Captain orders that the motor boat he is in (and Lt Hosmer and many others) set out for Navy Headquarters. There are many men in the motor boat and they put most onto a raft to be taken ashore. There are 11 men left in the motor boat, including the Captain, Chief and First Officers, Chief, First and Second Assistant Engineers, Lt Hosmer, Ensign Weinstein, Rhodes, SM Arthur Tumbur (? - one of the communications officers) and the injured man. This boat is rapidly taking water so at 1058 hours they put four men on a Navy motor launch and at 1105 hours all but the First Officer and First Engineer now get onto an invasion boat as the motor boat is rapidly sinking. The boat is towed by the invasion boat. At 1113 hours, the invasion boat comes along side the cruiser USS Chester and discharges the injured man and at 1125 hours they reach the shore in the vicinity of Luganville township. As a result of their actions, Captain Elwood Euart was awarded the Distinguished Service Cross and Captain Warren Covill, Lt Ward MacDonald and Warrant Officer Robert Moshimer were awarded the Soldier's Medal. The former liner S. S. President Coolidge, owned by the American President Lines, San Francisco, Calif., chartered and operated by the War Shipping Administration for the U. S. Army, was lost in recent weeks in the South Pacific. The vessel, operating as a transport, was fully loaded with troops and equipment when it struck a mine and sank. Through prompt and efficient rescue efforts casualties were limited to four men. Henry Nelon [sic - at this web site], 3714 Irving Street, San Francisco, Calif., who is a survivor, was master of the S. S. President Coolidge. The S. S. President Coolidge, Of 21,936 gross tons, was completed in 1931 at the Newport News Shipbuilding and Drydock Co., Newport News, Va. It was 615 feet 6 inches in length, had a beam of 81 feet 3 inches, and a draft of 28 feet 2 inches. As you can see, this report stated that there were four deaths but did not mention that the accident was caused by a US mine. It was not until a report appeared in the San Francisco Call-Bulletin on 15 December 1942 that the US public knew that the ship had been sunk by a US mine. The actual location of where the ship sank was not reported until April 1944, 17 months later. Until then, it was reported that the accident occurred in the Solomons area. Captain Nelson was charged before a military commission of "...through negligence suffering a vessel of the United States to be lost". I have attached some information about the three inquiries into the sinking in a separate page. ...all revealed something soldiers call "what it takes". The certificate I have was presented to Private First Class Wilbur O. Root, 20149675, from the Vermont National Guard from Rutland, Vermont. He was resident in 2004 at 99 Linden Street, Mechanicville, New York, 12118. Captain Elwood Euart's remains were finally recovered from the wreck in 2015 by a US Navy dive team after suspected bones were found some time earlier. 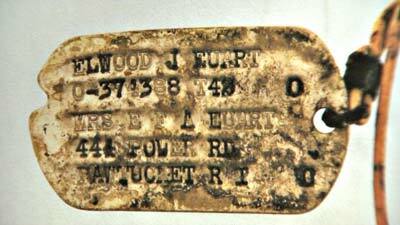 This included his dog tags (photograph shown above). He was buried with his parents. 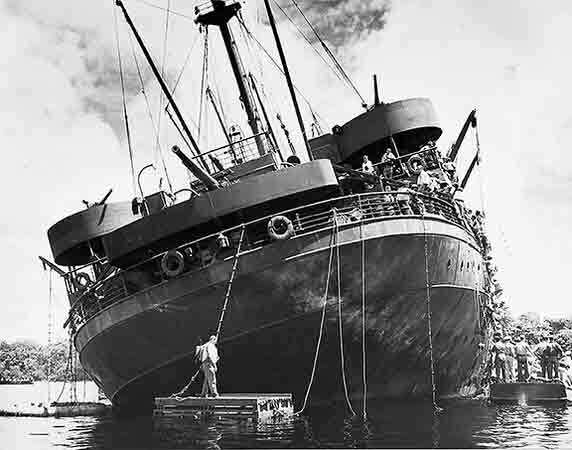 For more photographs of the SS President Coolidge story, click here. For a full transcript of Lt Craig Hosmer's Log Book for Monday 26 October 1942, click here.